This is a series of posts about Mozilla’s role in teaching web skills and web literacy. I’ve compiled all the posts here for convenience. We need to teach the world to code. Not just future engineers and web developers (although this is essential). But also teachers, journalists, filmmakers, artists, scientists and curious kids. These are the people who make much of the web. They need to understand code. 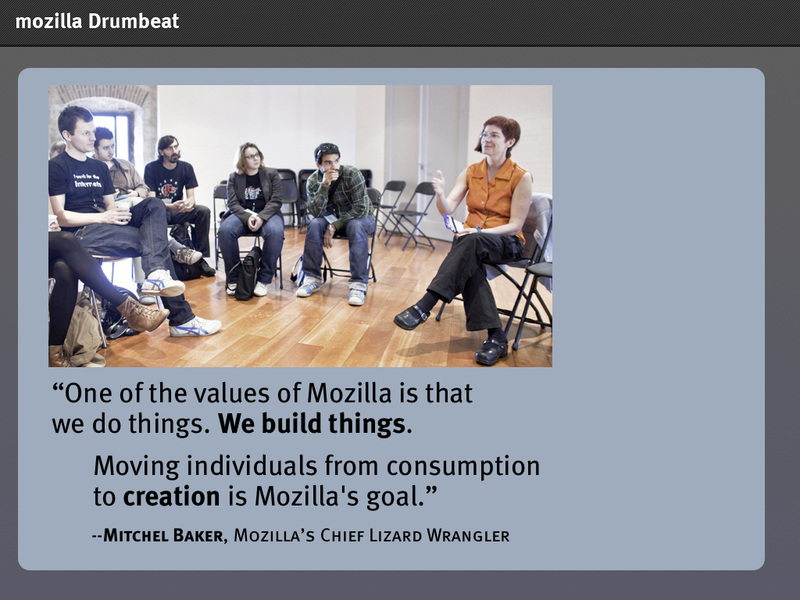 This has been the premise behind much of what we have done with Mozilla Drumbeat: people who make stuff on the internet are better creators and better online citizens if they know at least a little bit about the web’s basic building blocks. Even if they only learn a little HTML, the web gets better. This premise has been most explicit in Hackasaurus and School of Webcraft. Hackasaurus invites teenagers to learn the basics of HTML by remixing and making web pages, embracing the idea that that web is infinitely rewriteable. School of Webcraft offers study groups where people can learn more advanced web skills. While less explicitly educational, similar learning is happening in other Mozilla Drumbeat projects. For example, MoJo‘s fellowship program is all about bringing open web skills and thinking into newsrooms. It includes a learning lab with weekly guest lectures from mentors like Chris Heilmann and John Resig. And our partnership with the Bay Area Video Coalition introduces young filmmakers to the web as a canvas for their work, using tools like Popcorn to show what HTML5 can do for budding filmmakers. Of course, ‘teacher’ isn’t quite the right word for the role Mozilla is playing in all of this. Everything we’re doing is about learning through making and collaborating on the web. Everyone involved is teaching each other. But the point remains: Mozilla can — and should — be a driver of learning code. And in many ways, it already is — a global community of passionate experts constantly sharpening our skills through hands-on collaboration, learning what we need from each other as go. As we reviewed Drumbeat projects over the summer, the idea that teaching and learning about code is central to what we’re doing became clear. Our review also raised the question: could this idea of ‘Mozilla as teacher’ be a central part of what our community is about over the long run? Personally, I think the answer is yes. As I said in previous post, I believe Mozilla has an opportunity to become the most important technology learning and research org on the planet: a whole new kind of learning institution based on the principles of the web. Obviously, this is something much bigger than the few educational programs we’ve started in the last 18 months through Mozilla Drumbeat. But we do have the building blocks. School of Webcraft, Hackasaurus, Open Badges, Popcorn, MoJo, etc. all have elements that could be rolled into a much bigger, more ambitous vision for gettting people to teach each other to code. I have some concrete ideas on how this might work, spinning what we’ve started with Drumbeat into something bigger. Also, I’m thinking through how we connect a ‘Mozilla as teacher’ persona with a ‘Mozilla as inventor’ persona. I’ll post on these things soon. In the meantime, I’m wondering how this theme of ‘Mozilla as teacher’ resonates with people? Does the general idea feel right? Is there a different and better way to express it? Making is learning. Learning happens when we make. At least, this is the pattern we see when we look around Drumbeat. Projects explicitly about learning have put making things at their core. And, projects that started with making have added a big piece on learning. One thing I’ve noticed: particularly impressive learning happens when people get to make — or help make — something new and innovative. Something other people will use. Something that will have impact. By putting Dave’s (physical) classroom inside Brett’s (virtual) lab, the Seneca students had a learning opportunity like no other. Certainly, they had to learn fast and on their feet. At first, this is harder than learning from a textbook or making toy software. But, in exchange for hard work, students get help from the Mozilla community plus a chance to blaze a very real trail on the web. Based on the conversations I’ve had with Dave’s students, I’d argue this leads to deeper learning and, certainly, deep pride. Surprisingly (at least to me), MoJo has become another example of how we can connect learning and innovation. From the start, the project was about innovation, with aim of putting fellows into newsrooms to build a new kind of webapps. But learning has become an increasingly important goal for MoJo: we’ve realized we could help thousands of people learn how to use the web to reshape newsrooms, not just the 15 fellows we select. Admittedly, we don’t know how to do this at scale yet. The recent MoJo learning lab reached only 60 people, and was too closely tied to whether one became a fellow or not. But we did catch a glimpse of what might be possible through MoJo events and discussions that happened trough the challenge cycle. The idea of inventing new web things for the newsroom galvanized people, got them sharing ideas. It had people teaching and mentoring each other even if they didn’t know it. I say inventing here quite on purpose. There is pride and motivation in ‘making a thing’. Even more so a thing that seems new, novel or innovative. This sort of informal, fast, iterative invention is quite common and natural across Mozilla. It’s a good way to create valuable new tools for the web. Based on the little we’ve observed, this sort of ‘inventing’ is also a magnetic motivator for learning. This observation has influenced how I think. Mozilla-style, tinkerish invention should be a central part of the learning programs we develop next. We also need to focus strongly on basic web literacy. And to encourage people to use code to make things that are simply fun and fanciful. But the idea of ‘Mozillians as inventors’ should certainly be in the mix. Which leads me to this: if we want to create the biggest, most interesting technology learning organization on the planet (I think we should! ), Mozilla needs not only to be a school but also a lab. Not a school and a lab in any traditional sense: whatever we do must be open, distributed, global and peer-to-peer, just like an open source project. But certainly, we will need to build out spaces that are both about learning and inventing. 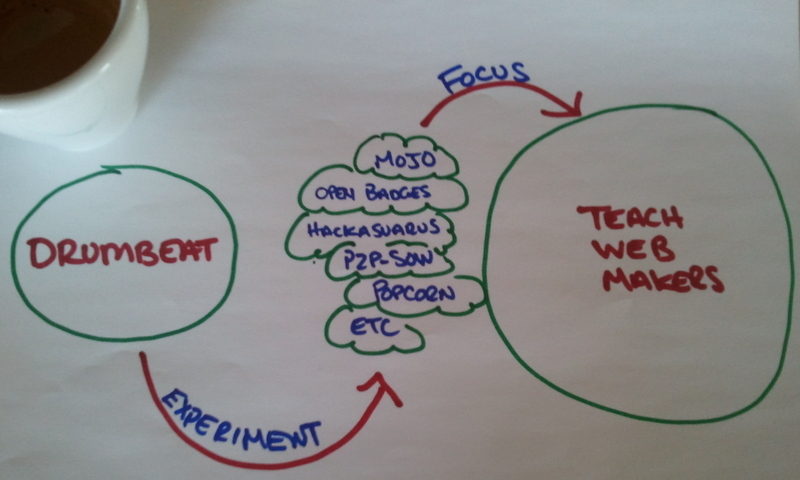 I have a practical picture in my mind of how this might work: how we might build Mozilla programs that mix school and lab, teacher and inventor. I will post on this next week. I’ll also post soon on the question on the ‘Mozilla as teacher vs. mentor’ topic. I agree with much of what people have said about ‘mentor’, but want to explore. In the meantime, I wonder: what do you think about this idea of Mozillians as inventors? Is it important to how we construct learning programs, or a distraction? Friendship is a powerful force for learning. Especially friendship built around a shared interest or passion. Space travel. Cooking. Technology. Gardening. Whatever. We tend to gather, explore, make, play — and learn — with friends who also share our passions. As people like Mimi Ito have shown with research: friendship and interests drive learning. Mozilla’s learning programs should to be designed around this combination of friendship and passion. Our mantra might be: people learn at Mozilla by building exciting things on the web with their friends. Notionally, all of our learning programs need to be built around a P2P pedagogy with a big emphasis on making things and expressing your passion. Or, as our friends at MacArthur often say to me, we need to be doing ‘connected learning’. I suppose that mentor seems like (and may be) a friendlier, perhaps even more modest word. I’ve had many mentors who were also my friends, but few teachers that were. Ken’s pointing to something critical here, even if indirectly: what makes the existing Mozilla community tick is a sense of common cause, collegiality, helping each other out, inventing and building things together. Friendship. We need to keep this idea of friendship at the core of what Mozilla in learning. The good news is that a collegial P2P learning spirit is already built into what we’ve been doing with programs like School of Webcraft and Hackasaurus. What we need to do now is figure out how to be more systematic, how to do this with some scale. Mentorship is likely one of the keys: encouraging senior community members to befriend and help others learn. The idea is to use friendship and shared interest to connect people with different experience levels. We’ve talked about building this kind of mentorship program like this with Hackasaurus and other youth-oriented programs. It’ll probably be one of the first new things we push on in 2012, alongside a badges program for web skills. We’re also working with the New Youth City Learning Network (more on this soon) to connect kids who are interested in science, art, poetry, hip hop, etc. with web technology that lets them express themselves. This is interest-based learning. Through Drumbeat we’ve already started to connected with interest-based communities: teachers; journalists; filmmakers; artists; etc. These people want Mozilla to help them learn how to apply the culture and skills of the web to their own domain. Many of them have also said they want to help Mozilla in return. These are the sort of new community leaders and mentors we’ll need if Mozilla wants to go big in learning. One question still looms: what does Mozilla going big in learning look like? I’m going to take shot at that in my next post. In the mean time, I’m interested to hear from people whether what I’ve written hear addresses some of the concerns people raised around my ‘Mozilla as teacher’ post. I’ve talked about Mozilla going big in learning quite a bit recently. Specifically, I’ve talked about making Mozilla the biggest, most innovative technology learning organization on the planet. I’ve also talked about the importance of doing this in a Mozilla-like way, with P2P pedagogy and strong focus on making. The question now is: how? The first step is fairly easy, or at least obvious: roll the best bits of Drumbeat into a single, coherent program designed to teach web culture and web skills at a global scale. This includes the clearly educational bits like Hackasaurus and School of Webcraft. But it also includes media and innovation programs like Web Made Movies and MoJo that are already helping new kinds of people learn, tinker and make things on the web. And, of course, it includes Open Badges as a basis for offering recognition and credit for what people have learned. My personal opinion is that it’s time for us to focus in this way. What we’re hearing from you is that we need to relentlessly focus on the small number of things we can be best in the world at. This is what separates all great organizations from merely good ones. by being the biggest, most innovative tech learning org on the planet. The idea: give people a clear way to advance through Mozilla learning programs and labs, and then recognize their achievements and contributions through badges. This not only provides a way to incent learning and mentoring, it will also help us build the next generation of Mozilla community leaders. The good news: we already have a head start. The best bits of Drumbeat give us a set of learning programs, software and community from which to build. Once we strengthen and systematize these things, we can snap them into a bigger learning offering like the one I am describing. We can then build up more content, a mentor network and Mozilla web skills badges system on top of these foundations that we’ve built through Drumbeat. Of course, we haven’t yet decided if this is what we want to do. There is huge opportunity in learning: Mozilla could help millions of people gain the literacy and skills they need to shape how the web works in their own lives and careers. However, dedicating ourselves to learning at this scale would be a big bet. It would take significant time, resources and patience. I want to start a broader conversation over the next few weeks to help deliberate and iterate on these ideas. It starts with the simple questions: Should Mozilla go big in learning? and What would that look like? I’ll do a summary post early next week as a way to focus this conversation. However, I’d be happy to hear people’s thoughts a comments on this post in the meantime. I want to us create a web literate planet. One where almost everyone — filmmakers, teachers, scientists, artists, bankers — understands what’s going under the hood on the web. Can take things apart. Remix them. Express what they want the web to be. Since starting Mozilla Drumbeat 18 months ago, I have seen that there is a thirst for this. When we gained literacy, we learned not just how to read but to write. And as we now moved into an increasingly digital reality, we must learn not just how to use programs but how to make them. I experience this thirst even more viscerally when I look at the web makers, including my 11 year old son. He posts video game commentaries online everyday. He craves creating things on the web. Yet, increasingly, he bumps up against the black box of YouTube, unable to take it apart, understand it or reconfigure how it works. He is not fully web literate. As outlined in a number of posts recently, I believe Mozilla can play a leading role in creating a web literate planet. Concretely, I think Mozilla can — and should — build out a major P2P learning initiative that teaches web skills and web literacy to coders and non-coders alike. We should also take an active role building up the whole ecosystem of orgs emerging around web literacy and innovative, web-like learning. Post #1: Our biggest achievement in the first 18 months of Drumbeat has been carving out a new way for Mozilla to work: teaching and building things with people I call ‘web makers’. The next thing we should do is build on this particular aspect of Drumbeat. Post #2: The people I am calling web makers are teachers, filmmakers, journalists, artists, scientists, game makers and curious kids who a) want to be part of what Mozilla is doing and b) are making things using the open building blocks that are the web. Post #3: We need to teach the world to code. Or, more specifically, we need to mentor web makers on a massive scale, giving them new skills to make their corners of the web more creative, participatory and open-ended. We need a big community of mentors to do this. Post #4: We’ve noticed something: impressive learning happens when people get to make something new and innovative. If we want to drive learning, we also need to build a lab where people are invited to tinker, make and invent future pieces of the web. Post #5: At the foundation of all this, we need a P2P pedagogy built around friendship and passion for a particular topic or interest (e.g. hip hop). Our mantra might be: people learn at Mozilla by building exciting things on the web with their friends. Post #6: To make this concrete: we need a clear simple Mozilla learning program that anyone can dive into, no matter their age or skill level. This starts with the best bits of Drumbeat: Hackasaurus, School of Webcraft, MoJo, etc.. And is wrapped in a system of Mozilla badges that recognize the most skilled and generous community members. What I am proposing is building a global P2P learning institution, tinkering lab and web skills certification system into the core of Mozilla’s work. Which raises the question, doesn’t this already exist? Partly yes, but mostly no. Lots of people teach about computers. Few people teach about the web. For school age kids, the bulk of the focus remains on basic office apps and watching out for cyberbullies. And, for adults, the most popular out of school tech programs still continue to be things like the MCSE and Cisco Academy. Technical, but not very webbish, and certainly not at all helpful to the web makers. Similarly, many people talk about educational innovation on the web. Few are trying build web-like learning experiences where making, tinkering and collaboration are at the core. You can see this in the myriad of e-learning and open educational resource sites that simply present videotaped classroom lectures. They aren’t even aiming a P2P pedagogy that works like the web. Luckily, there are pioneers who are pushing forward on both web literacy and p2p pedagogy. Projects like Code Academy, Young Rewired State and CodeNow are teaching people great web coding skills. And people like Howard Rheingold, Cathy Davidson, Philipp Schmidt, Katie Salen, Dave Humphrey and everyone in MacArthur’s broader digital media and learning community are building learning experiences that work like the web. These are Mozilla’s allies, people we can both learn from and support as we build out a broader ecosystem around all of these ideas. For now, we have a question: should Mozilla go big in learning? And how? The role we can play in teaching web skills and web literacy at a massive scale is clear, at least to me. And there is huge potential to contribute more broadly to learning innovation with things like Open Badges. But, as we deliberate on where to go next with Drumbeat, are these the right places to focus our energy? PS. If you want to read more detail, I’ve posted all of my posts on this topic on a single page here. Great projects. Would Mozilla be interested (or Mark) to share the Drumbeat movement at a regional conference in the Pittsburgh area, (www.tretc.org) in November? There’s great interest in the Maker movement in Pittsburgh. We need to make people aware of WebMakers. ToTTaLLy In with your ideas here.. one thing that has surfaced in my learning-teaching path is the level of OS knowledge. Ppl need to use Win + Mac + Unix to understand how their machines really work! M thinking of creating a badge for that.. Mozilla shd start an online learning academy.. I would surely chip in with evrything!!! we will only begin to know, understand, and feel/enjoy the effects and depth of the web after we’ve hit a critical mass percentage of the population becoming code literate. man, i love how you put this all together, sometimes i can’t wrap my head around the big picture, especially with so many projects going simultaneously. love web. this is all so exciting.